Hutchinson’s are carrying out a conservation project on the old boy’s school house at Brampton Village Primary School. Taken over from the Church in the 1960’s, the current owners Cambridgeshire County Council, had planned a major overhaul of the external brickwork facade during the summer break of 2016. However, once the building was scaffolded and examined more closely during the brick repair project, it became apparent that extensive repairs were also required to many of the major structural elements of the building, including large structural masonry buttresses, eaves, tie beams and roof timbers. In fact, timber analysis proved that the decay was so extensive, the building had to be placed out of use and the roof had to be stripped in order to reduce the weight on the roof purlins and trusses, until such time as repairs could be undertaken. 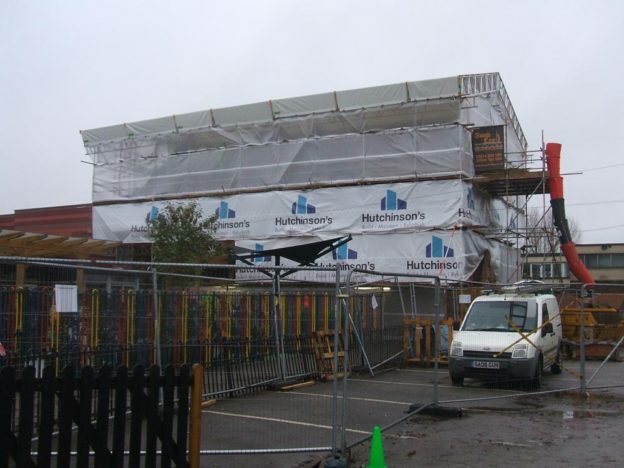 A very much larger scaffolding had to be erected in order to achieve this and, right now, Hutchinson’s are working to replace and rebuild the upper wall sections, north eave and gable, copings and rotten roof timbers. Once these repairs are complete, the building will undergo a major cosmetic transformation, with a new clay roof tile covering planned, along with repointing of all original red brick elevations, bringing the building back to it’s former glory and more in keeping with how it might have looked when it was first built in the 1850’s. Traditional lime mortar and masonry techniques are being used to ensure the restoration work is as close to the original as possible. Even the original mortar was analysed and chemically matched, and the project is set to complete in early spring 2017, now that the engineer’s from Atkins Global are satisfied that all of the former defects have now been discovered and rectified.